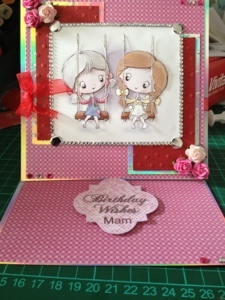 I have made this card for my mother in law using the SWALK decoupage from Reddy, used the dotty emboss folder (darice) used some candy. Some flowers and gems. The birthday wishes topper comes from the meadow cottage bears cd rom.